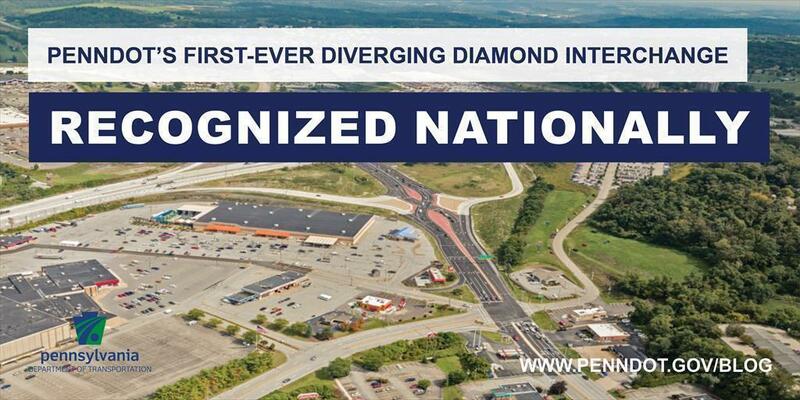 PennDOT's first-ever diverging diamond interchange, or DDI, was recognized last year as one of the top 10 road projects in North America by Roads & Bridges magazine. The DDI is part of the department's long-term improvement plan for Interstate 70 in Washington County. The project came in at No. 7 on the list for its reconstruction of the State Route 19 (Murtland Avenue) Interchange, but also involved reconstruction and widening of 1.4 miles of I-70 from two to three lanes. The transition from the old to the new interchange occurred overnight, with the DDI being opened to traffic early on September 14, 2016, under a temporary condition. All work to construct islands and complete final paving was finished last summer. Traffic on Route 19 crosses over to the opposite or left side of the roadway within the interchange area. The left-turn movements from Route 19 to the I-70 on ramps occur from the far-left side of the roadway eliminating the need to cross opposing travel lanes. The benefit is free flow left turns onto the I-70 ramps. The left-turn movements from the I-70 exit ramps to Route 19 do not need to cross opposing travel lanes to gain access to the desired lanes on Route 19. This innovative interchange is unique, in that traffic on the non-freeway approach crosses to the opposite side of the roadway between the ramp intersections. The DDI and other initiatives allowed the project to be constructed with no commercial displacements and minimal right-of-way acquisition in a very developed area. To celebrate the project, Governor Tom Wolf and PennDOT Secretary Leslie S. Richards participated in a ribbon cutting on August 17, 2017. For more information on upcoming or current PennDOT projects, visit www.projects.penndot.gov​.